From left, Japanese Minister of Economy, Trade and Industry, Hiroshige Seko, European Commissioner for Trade, Cecilia Malmstrom, and U.S. Trade Representative Robert Lighthizer, pose for media before meeting in Washington, Jan. 9, 2019. The United States on Friday signaled it would not bow to the European Union's request to keep agriculture out of planned U.S.-EU trade talks, publishing negotiating objectives that seek comprehensive EU access for American farm products. The objectives, required by Congress under the "fast-track" trade negotiating authority law, seek to reduce or eliminate EU tariffs on U.S. farm products and break down non-tariff barriers, including on products developed through biotechnology, the U.S. Trade Representative's (USTR) office said. EU trade commissioner Cecilia Malmstrom told U.S. Trade Representative Robert Lighthizer in Washington on Wednesday that the 28-country bloc could not negotiate on agriculture in a new, more limited set of negotiations expected to start this year. "We have made very clear agriculture will not be included," Malmstrom told reporters after meeting Lighthizer, adding that the two sides had not yet agreed on the scope of the talks. 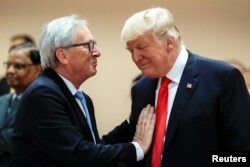 U.S. President Donald Trump, right, talks with European Commission President Jean-Claude Juncker, left, before a working session at the G-20 summit in Hamburg, Germany, July 8, 2017. Trump has long complained about Europe's 10-percent import tariff on autos. The U.S. passenger car tariff is only 2.5 percent, although U.S. tariffs on pickup trucks and other commercial trucks are 25 percent. The U.S. negotiating wish list does not specifically mention autos, but pledges to seek duty-free market access for U.S. industrial goods that eliminate non-tariff barriers such as "unnecessary differences in regulation." USTR's decision to push for a full-fledged trade negotiation on agricultural goods follows a hearing in December at which U.S. farm, food and beverage groups argued for their products to be included. Sen. Chuck Grassley, R-Iowa, speaks during a news conference on Capitol Hill, Dec. 19, 2018, on prison reform legislation. 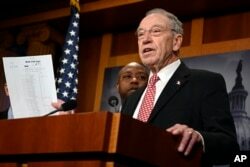 Influential lawmakers such as Senate Finance Committee Chairman Chuck Grassley, an Iowa farmer, have warned they might not support an EU deal that did not include agriculture. Now that the U.S. objectives have been published, the USTR may be ready to formally launch negotiations in as little as 30 days. But the EU's own negotiating mandates on industrial goods and regulatory cooperation need to be cleared by the European Commission, the bloc's executive branch, and approved by member states, and it is unclear how long that process will take. The United States had a $151 billion goods deficit with the EU in 2017, despite two-way annual trade of about $1.1 billion. USTR also said it will seek commitments by Europe not to impose duties on any digital downloads of U.S. software, movies, music and other products nor any rules that restrict cross-border data flows or require data localization, USTR said. In an objective aimed at Europe's efforts to tax products and services from U.S.-based internet giants, including Alphabet Inc's Google, Facebook and Amazon.com, USTR said it would seek a "guarantee that these products will not face government-sanctioned discrimination based on the nationality or territory in which the product is produced."